The Maze Runner is a 2014 American science fiction action thriller film directed by Wes Ball, based on James Dashner‘s 2009 novel of the same name. The film is the first installment in The Maze Runner film series and was produced by Ellen Goldsmith-Vein, Wyck Godfrey, Marty Bowen, and Lee Stollman with a screenplay by Noah Oppenheim, Grant Pierce Myers and T.S. Nowlin. The film stars Dylan O’Brien, Kaya Scodelario, Thomas Brodie-Sangster, Ki Hong Lee and Will Poulter. The Maze Runner is the latest of Hollywood’s films aimed at the Young Adult audience and where the movie is adapted from a book of the same name. 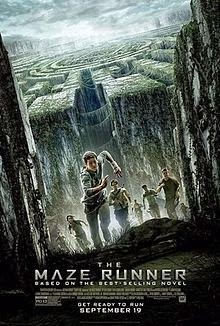 It follows the story of Thomas and other “Gladers” as they struggle to find a way to escape the maze. Overall the casting was superbly done and the actors were well suited to the roles they were playing. Particularly Chuck, by Blake Cooper was an excellent slightly annoying little boy who produced the comedic value in the film. Newt, played by Thomas Brodie-Sangster portrayed a very convincing second in command who suffers a conflict of interest between what is done and what should be done to try and exit the maze. Thomas, Dylan O’Brien managed to convey a strong yet scared character throughout who always believed that there was something wrong with what was happening and convinced that he would do something about it. Throughout the film there is a lot of action yet inter-spaced with this is many valleys of slow world-building information which will be used in later possible movies so that the viewer understands what their world is like and why what is happening is happening. This makes the film feel very stop-start and results in a loss of interest throughout these elements. The grievers are cyborg-like spiders with a scorpion sting like tail which are very creepy yet have a fleshy organ system. These things kill those who remain in the maze come nightfall and can be the stuff of nightmares. These CGI elements added the depth and structure to the film and allowed those who read “Lord of the Flies” the differences needed to differentiate some similar plot elements. Especially with Thomas and Piggy Chuck near the end. The cinematography was very good. There were some elements of shaky camera angles that were sometimes distracting but overall the footage was shot very well and the music added an ambience which was needed as during the times the music was most prominent the story had slowed down. Overall the film was a good watch and very creepy at times. The 12A rating (UK) could be scary to some viewers of a nervous disposition or who don’t like general gore. Previous Post Bookshelves and You.